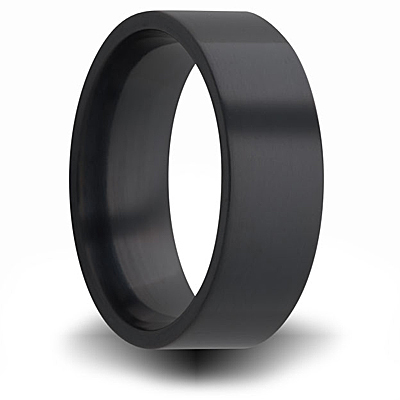 Solid black zirconium ring has a flat pipe cut center and high polish finish. Ring measures 7mm wide. Made in USA. Comfort fit. Blackened through an intense thermal process allowing the graphite black color to go several microns deep. This is a superior black finish over black tungsten or titanium as it is not a coating and therefore impossible to rub or scratch off with normal wear. The black does not go all the way through the ring making it possible to mill grooves or custom designs letting the steel-gray luster shine through Is approximately 8 on Mohs scale of hardness. It cannot break or shatter, however it can dent, but it's extremely difficult to do.